Barrel & Bushel is a neighborhood restaurant, located in the heart of Tysons Corner, serving classic American cuisine handcrafted from the region’s freshest, seasonal ingredients. Our sophisticated-rustic dining room and bar evokes simplicity and warmth inviting travelers and local residents to gather and celebrate the best flavors of the season. 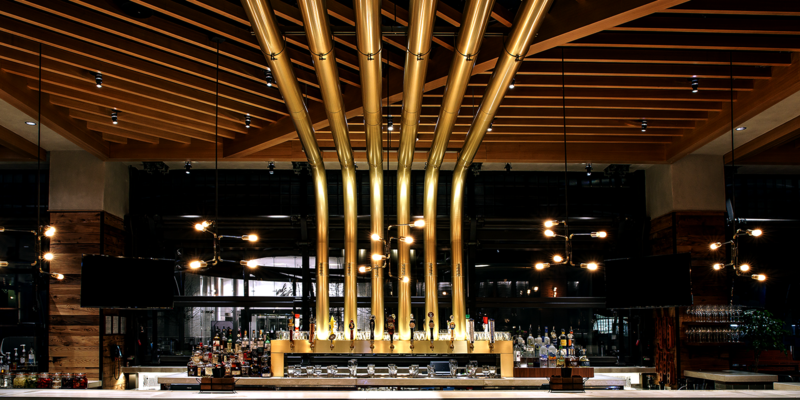 The overtly barrel-forward design of our restaurant will entice your appetite, delight your senses and spark your curiosity. Our friendly and knowledgeable staff will select from more than 30 regional craft beers on tap and 65 handpicked bourbons, each telling a unique story with complex flavors, to compliment your meal. Touches of dark oak, industrial finishes and a modern indoor-outdoor concept creates an airy, contemporary atmosphere. On warm days, enjoy a breezy dining experience in the casually-chic dining space when the glass garage doors are opened on to the patio. On cool evenings share a blanket and a cocktail next to one of our gas fire pits. Joins us for Brunch Saturday and Sunday! Call for Reservations Today! See Full Menu in Calendar Details. ENJOY Berry Blossom our cocktail of the month. Made with gin, fresh squeezed lemon, blackberries and topped with ginger beer. © 2019 Barrel & Bushel. All rights reserved. View site map. Barrel & Bushel website is served by Flavor Plate.